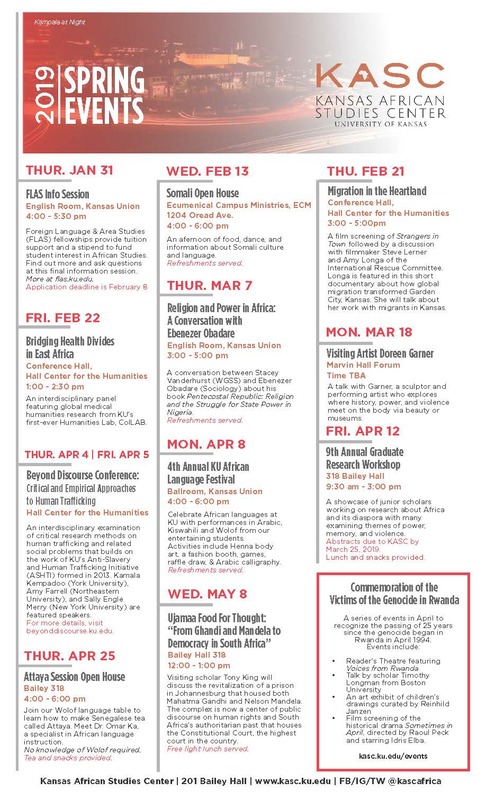 LAWRENCE — The Kansas African Studies Center is hosting the University of Kansas' third annual Africa World Documentary Film Festival (AWDFF) from April 10-12. The three-day festival will show 18 films that address the complexity of the human condition as experienced and expressed by the denizens of the KASC diaspora. Each film submitted by directors all over the world delivers a portrayal of various regions of Africa and African culture beyond stereotypical images presented in the media. Documentary film topics range from the legacy and influence of a famous Berlin-based Afro-American poet in “Audre Lorde: The Berlin Years” to Ugandan LGBT rights in the face of an anti-homosexuality law in “City of the Damned”; to the lives of refugees in the United States through the eyes of one Somalian family in “Finding Home.” The festival will also feature “Lost and Found in China” —the sequel to “Red, White, Black & Blue,” which was shown last year — this time following the coed rugby team through a tour in Hong Kong and China where legendary player Stuart Krohn made his career. The Africa World Documentary Film Festival is a 7-year-old international traveling tour sponsored by the E. Desmond Lee Professorship in African/African American Studies, International Studies and Programs, and University of Missouri-St. Louis. ; KU is its fifth stop. The festival moves from Lawrence onto Philadelphia, St. Louis, South Africa, United Kingdom and concludes in Jamaica. Sponsors include the Ermal Garinger Academic Resource Center, KU Libraries, Center for Global & International Studies; University Honors Program, Center for East Asian Studies, the departments of Economics, Religious Studies, African & African American Studies, Women, Gender & Sexuality Studies; Film & Media Studies, Political Science, Anthropology, History, Multicultural Affairs, Black Student Union and African Student Association. Films will be screened in 3139 Wescoe Hall, the Spencer Museum of Art auditorium and Alderson Auditorium in the Kansas Union, starting at 4 p.m. Thursday, April 10. This event is free and open to the public. For the complete film schedule and trailers, check out the online program.